Scientists say that 350 parts per million CO2 in the atmosphere is the safe limit for humanity. 350 parts per million is what many scientists, climate experts, and progressive national governments are now saying is the safe upper limit for CO2 in our atmosphere. There are three numbers you need to really understand global warming, 275, 390, and 350. For all of human history until about 200 years ago, our atmosphere contained 275 parts per million of carbon dioxide. By now (this is the second number) the planet has 390 parts per million CO2 – and this number is rising by about 2 parts per million every year. Propelled by the news of these accelerating impacts, some of the world’s leading climate scientists have now revised the highest safe level of CO2 to 350 parts per million. That’s the last number you need to know, and the most important. International Day of Climate Action was observed in Nepal on 24th Oct, 2009. The initiative in Nepal was organized by 1Degree Initiative Nepal (1di.org) on behalf of 350.org. Different activities were performed all over the world on same day. 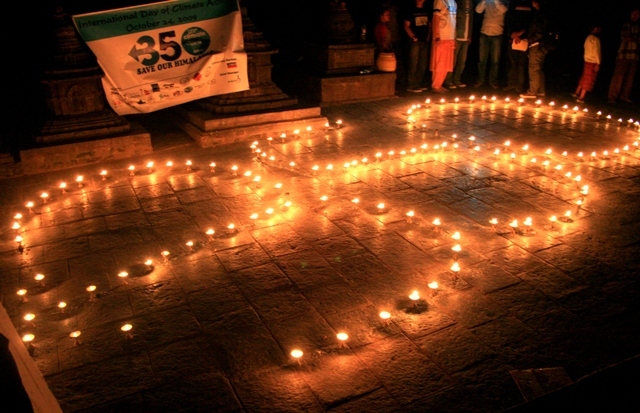 We, from EU participated in the 350 Initiative, the event concluded in Swayambhunath by collectively lighting the oil lamps composing a structure of 3 5 0.